Last month I was giving a little talk at my friend Sara’s church when someone asked me where the best beach was to go swim and play in the sand. I was actually a little relieved to get this question because it was one I had an answer to! Dash Point! The deal is there are Two Dash Points. One is actually a MetroParks Tacoma spot, even though it’s that part of Tacoma that starts to feel like Federal Way. The other one is a state park-that’s it in the pic above. Both are wonderful spots for beach loving kids. I prefer the expansive state park, but you’ll have to buy a Discover Pass. So, now that we’ve got that cleared up (I hope)! here’s the complete list of our favorite beach outings around here. Be sure to let me know if I missed yours! Dash Point State Park Close to 400 acres of forested trails and sandy beach front. You’ll need a Discover Pass. Dumas Bay Park in Federal Way-A nearly always empty neighborhood park. Follow a winding, forested path and emerge (like magic!) on a stretch of sandy beach. It’s a little tricky getting here mainly because you’ll pass a Dead End sign and go through a residential neighborhood. It’s o.k….keep going. Note-a reader did point out to me after I first did this post that this is a protected area, so the kids aren’t supposed to dig or collect things. If that doesn’t sound like much fun, you may want to try one of the others. 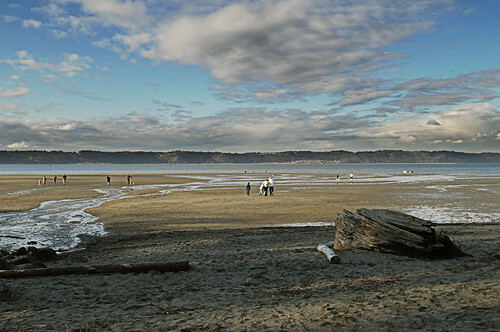 Owen Beach, Pt.Defiance-Rocky beach but great for watching people and ferries! It can get crowded, but the parking lot and the beach are huge, so you’ll have plenty of room to spread out. Kopachuck State Park, Gig Harbor-This is one of my old haunts. Locals fought to keep it open, and we should all thank them. Lots of great forest and trails to explore and prime shorefront. Rocky but fun to find crabs and other sea creatures. I haven’t been here since many of the trees were felled due to disease. If you have, let us know how it’s looking! My Thurston area readers recommend Tolmie (a state park) or Priest Point. We’ve been to Priest Point, but after the playground and hiking a bit we ran out of time for the beach. The South Sound Estuary Association hosts low tide events at these spots during the summer months. If what you’re after is sand, there are also some area lakes and rivers that offer a bit of it. You can read my post on South Sound beaches with sand for the scoop on those (Scoop, get it)? I also have a round-up of low tide events all over the South Sound. For low tide, I like Des Moines Beach Park. It is rocky, but there are a lot of fun beach animals to see like crabs and jellies. http://www.seattlesouthside.com/attractions/883-des-moines-beach-park. Tolmie is good, but a bit small. I had a friend recommend Burfoot County Park, way out past Priest Point. It was great! Rocky, but good for swimming. It’s a hike to get there from the parking lot, so leave the stroller at home (I’m glad I keep my front pack in the car!). We went during the week, and wasn’t crowded. Have you checked out the Narrows beach in Gig Harbor? We really like it there cause there’s a lot more sand!